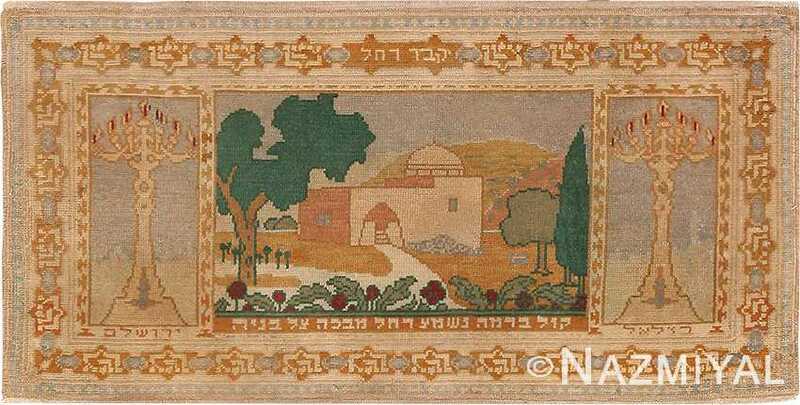 A Magnificently Artistic Vintage Israeli Bezalel Rug, Country Of Origin / Rug Type: Israeli rugs, Circa Date: Mid 20th Century – This vintage Israeli Bezalel Rug is reminiscent of the cool tile work and ancient mosaics floors found in the old reflecting pools. The use of geometric motifs and color placement reflects timeless traditions in Middle Eastern and Near Eastern artwork. 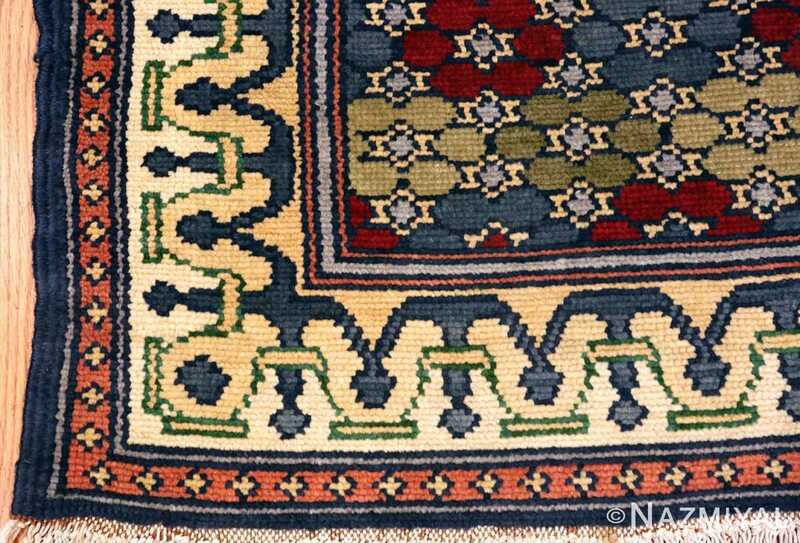 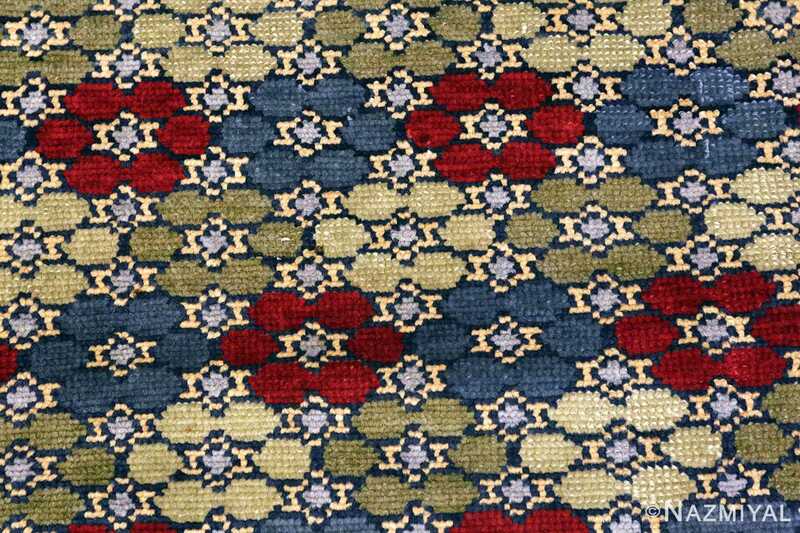 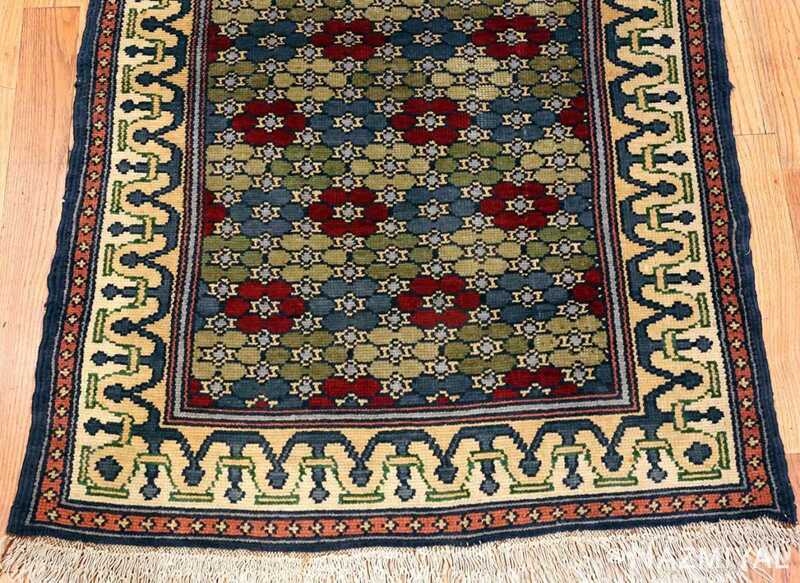 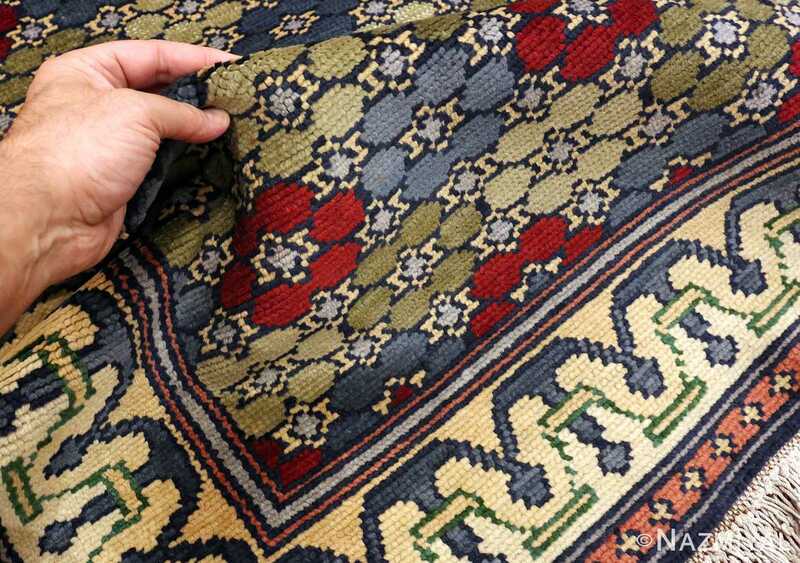 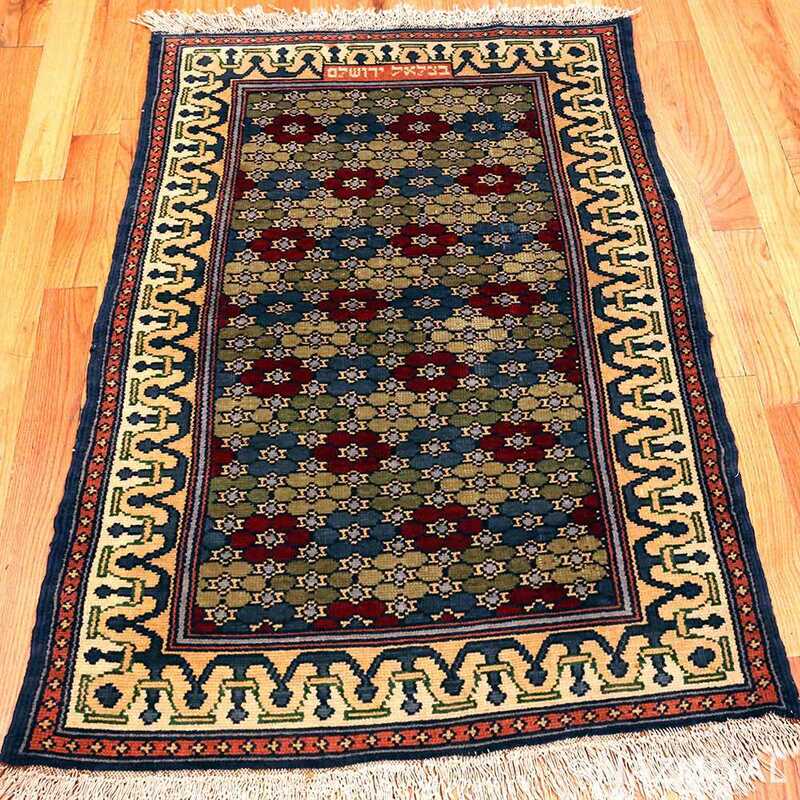 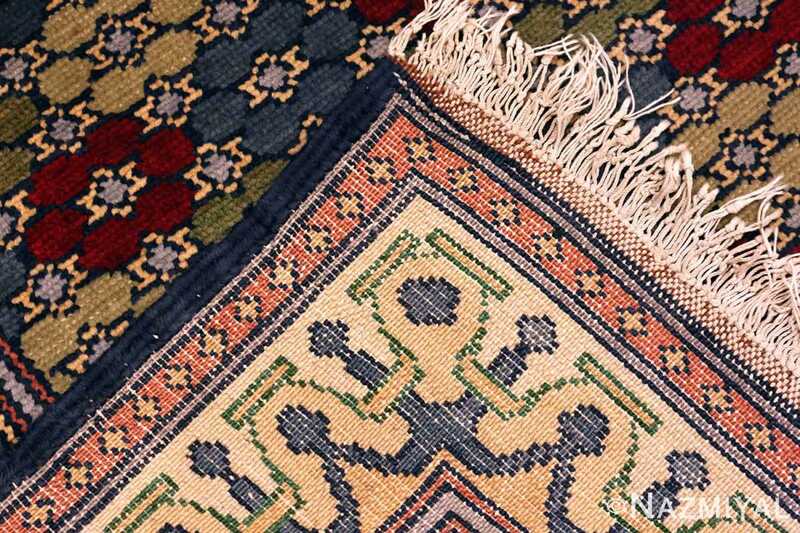 The vintage Israeli rug is beautifully carried out using cool blue, olive green, ivory / tan / creams, salmon, grey and a splash of red for interest. 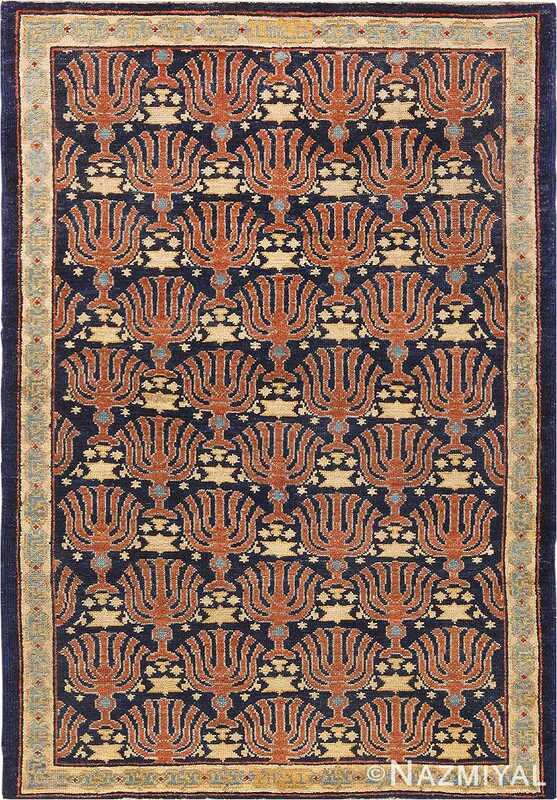 The rug colors blend beautifully to create the feeling of a cool reflecting pool that once adorned the courtyards of great estates. The overall design of this magnificent vintage mid century modern rug is simple and uses repetition to create a sense of tranquility and calm. The overall design appears to extend beyond the boundaries of the formal border, allowing the eye to explore the space beyond the borders in the mind’s eye. 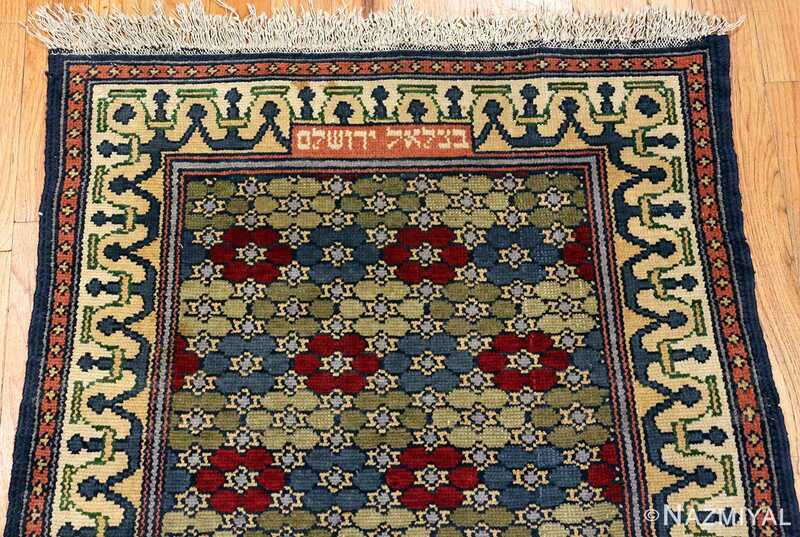 The pattern of this rare Israeli Bezalel rug consists of a regular repeating pattern with contrasting crimson motifs placed regularly throughout the design. 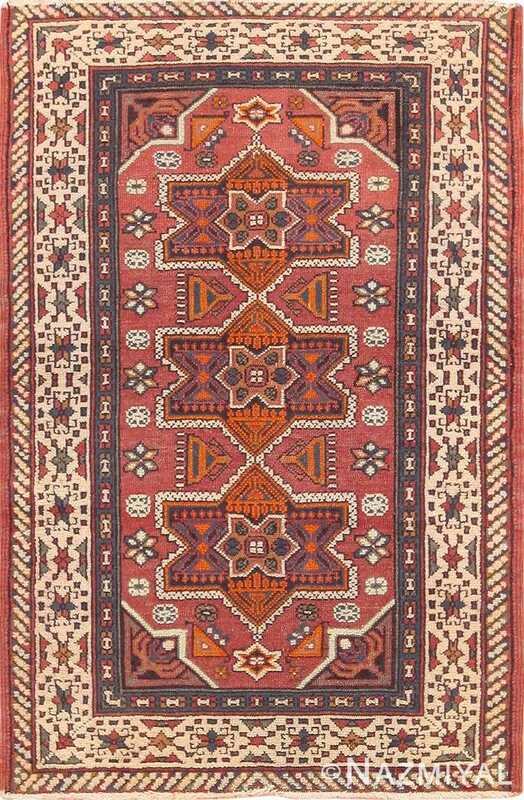 The crimson stands out as focal point, as the rest of the colors are of similar tone and hue, making it have a calming effect on the viewer. 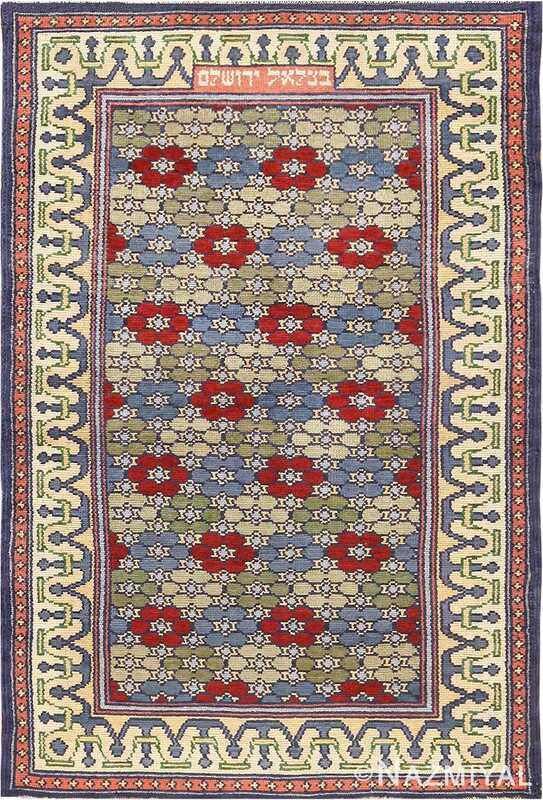 The overall composition and impact of the design is quite reminiscent of the Art Nouveau movement. 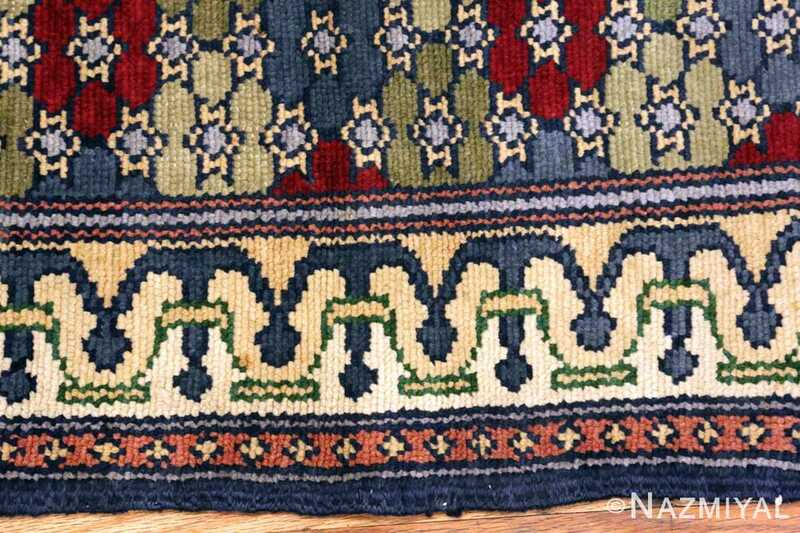 This aspect is a common thread that we see quite often in the vintage and antique rugs that were woven in the Bezalel Art School in Jerusalem Israel. 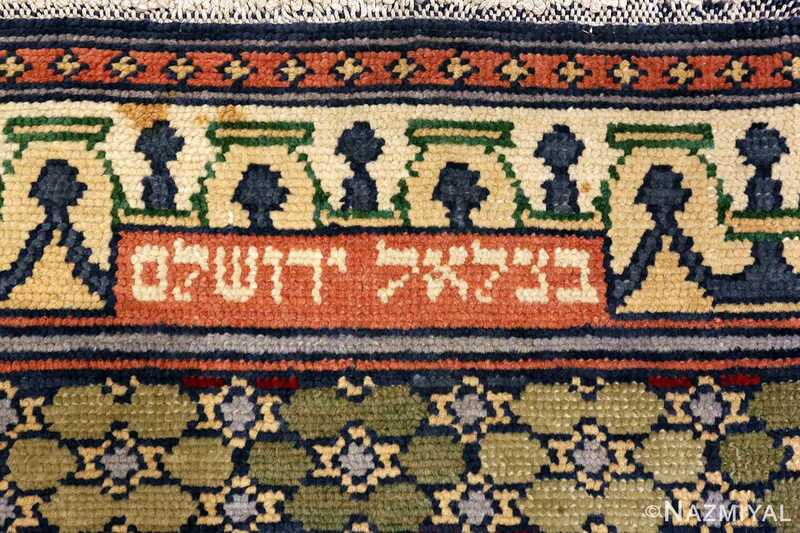 Hebrew writing which translates to “Bezalel Jerusalem” appears on one end the design, making it clear as to the origin of the design. This is a breathtaking rug pattern that is executed beautifully and would go well in any traditional or modern home or office. 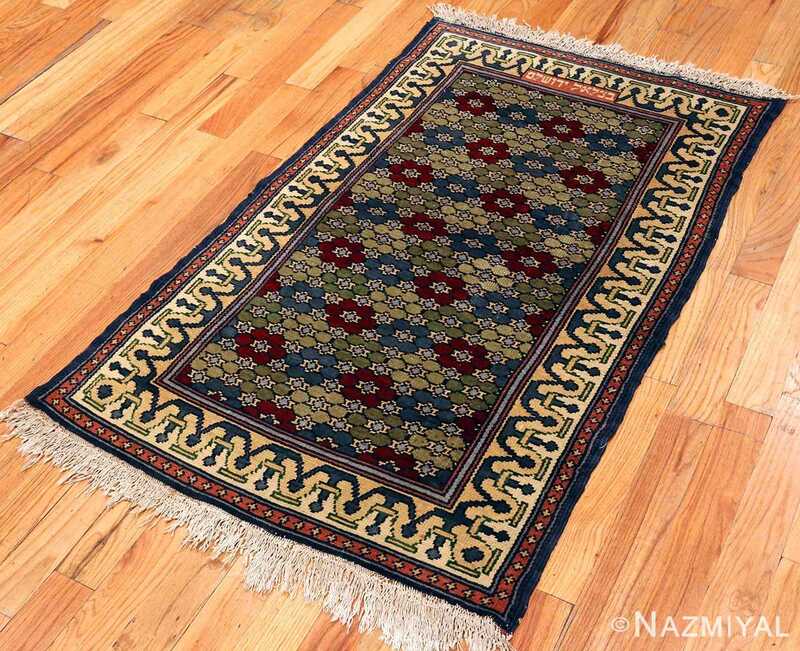 It adds a feel of calm tranquility to any room and would be a beautiful addition to any decor.